God I hope not. Was frustrated by that all year. 2018 Final Total Defense rating is ugly. #72 Ohio St.	403.4 avg a game. I predict the 2019 Defense rating will be a top 20 unit. calibuck and ShowMeBuck like this. I didn't think he was that bad for his first full year starting. Maybe we'll see more "nickel" coverage this year? If that happens and offense is top 10.....look out. When Ryan Day was named Urban Meyer’s replacement as Ohio State’s next head coach, he soon began putting his coaching staff together. He ended up replacing four members of the defensive staff, and wisely kept Larry Johnson. Just as Meyer did in 2014 when he wanted a specific style of defense and brought in Chris Ash as defensive coordinator to make that happen, Day has handpicked his defensive coordinators with an eye towards an aggressive, yet simplified attack. The four new defensive assistants all spoke to reporters on Wednesday and Day’s vision marched right alongside their own. Co-coordinator Jeff Hafley was asked if he was a scheme guy or a guy who molds the scheme to the talent on hand. How he intends to make the most of that talent is where things differ a bit from the last two seasons for the Buckeyes. The Ohio State defense had its struggles each of the past two seasons. According to new assistant secondary coach Matt Barnes, when your defense is consistently not playing well, there’s usually one area to examine first. Rewatched the scum game for cardio today... damn can Wade hit. He needs to start and shouldn't be splitting reps equally with anyone. Want to rest him that's fine but he should be on the field when he isn't tired. Wade/Okudah could be on par with 16' starting 2. Taosman, buckeyboy, brodybuck21 and 1 other person like this. Really excited about what JH brings to the table coaching the secondary. We have a plethora of riches back there and if everything comes together it can end up being scary good. Taosman, RB07OSU, bukIpower and 1 other person like this. Agreed. Put those two as lockdown outside corners and have Arnette in the nickel. Then White and Fuller back at safety. I think that is a pretty darn good group of 5 for Halfley to start off with. scarletngray, OGWheels, RugbyBuck and 1 other person like this. Kendall Sheffield arrived in 2017 from junior college and worked his way into the starting rotation alongside Denzel Ward and Damon Arnette as a redshirt sophomore. After his second season in the rotation last year, he opted to forgo his fifth-and-final year of eligibility and enter the NFL Draft. Sheffield finished eighth on the team in tackles (35), second in interceptions (2), and tied with Shaun Wade and Jeff Okudah for most passes defended (10) last season. He was also the least penalized cornerback in the rotation, getting flagged for interference just once on the season, compared to four for Okudah and five for Damon Arnette. Now with Sheffield off to the League, the Buckeyes will have to decide how they want to proceed at cornerback in 2019. New co-defensive coordinator Jeff Hafley talked about scouting OSU’s cornerbacks in the NFL and being puzzled why they were rotating. But then when he was seeing them every year, he understood and now brings that realization back where it began. In other words, if a player is good enough to play, he’ll play. If the Buckeyes have three corners worth rotating, then they’ll rotate just as they have done since 2016. Ohio State returns Damon Arnette and Jeff Okudah, who were both in the rotation with Sheffield last year. The common theory is that the rotation will continue if possible. The first name that comes to mind when thinking about continuing the rotation is redshirt sophomore Shaun Wade. Wade was the team’s nickel back last season and led the Buckeyes with three interceptions. He also spent the last two-thirds of the season at free safety, which is a possibility this season as well. Ohio State signed three freshmen cornerbacks in the 2018 class. The highest-rated among them was Tyreke Johnson, who ended up redshirting. Johnson was a 5-star safety signee from the same high school as Wade. Classmates Sevyn Banks and Cameron Brown each went a game or two past the redshirt threshold. Junior Marcus Williamson battled injuries last year and has played sparingly in his first two seasons as a Buckeye. Ohio State did not sign any cornerbacks in the 2019 class. MGMT and RugbyBuck like this. I am with you. Sheffield was serviceable, but far from elite like his predecessors. The mix of Okudah, Arnette, Wade, Johnson and Williamson (who I think can be a lock down corner if healthy) should have Halfley salivating. We should have improved play at the corner position this year if the coaching and scheme is there. kujirakira, mendensa, RugbyBuck and 1 other person like this. Morning Constitutional: What Will the Rushmen Package Look Like in 2019? The early days of Ohio State’s Rushmen Package began in 2015. Designed to get the four best pass rushers on the field at the same time on passing downs, the Rushmen satisfied defensive line coach Larry Johnson’s desire to put as much pressure on the quarterback as possible. The Rushmen probably would have begun in 2014, which was Johnson’s first year at Ohio State, but the loss of defensive end Noah Spence ended those possibilities before they began. 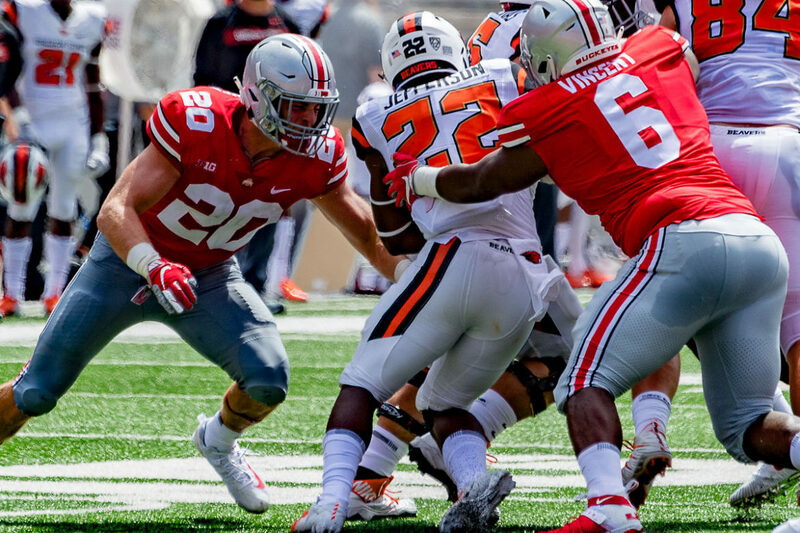 The 2015 iteration featured Joey Bosa, Tyquan Lewis, Sam Hubbard, and Adolphus Washington, but it truly took hold in 2016 when Jalyn Holmes and Nick Bosa joined Lewis and Hubbard. There were no defensive tackles in the mix at all, and it remained that way again in 2017. In 2018, however, defensive tackle Dre’Mont Jones was a part of the package, and it was one of the reasons he chose to return for a fourth season. Alongside Jones was a mixture of defensive ends in Bosa, Chase Young, Jonathon Cooper, and true freshman Tyreke Smith. Bosa’s days inside were over, however, which is why Smith was in there early on. The results were mixed. The Buckeyes finished second in the Big Ten with 41 sacks, but did not get any tackles in the backfield from Smith. With both Bosa and Jones now gone, there are two opens spots on the current edition of the Rushmen and there are several candidates to choose from. Young and Cooper will be the two guys outside, but the tough part is figuring out who is going to move inside on passing downs, which we saw Tyreke Smith do last year. Neither Young nor Cooper are likely to slide inside, which is why the position calls for some unique skill sets. Could there be another defensive tackle in the mix, like we saw with Jones last year? Larry Johnson had Tracy Sprinkle pegged for it a few years ago before he injured his knee in the season opener. If a defensive tackle is going to win the job, he has to be a great pass rusher. Sophomore tackle Taron Vincent has tons of promise, and quickness to boot. If we’re talking tackles, he may be the best bet. Fifth-year senior Jashon Cornell is also an option. He moved from tackle to defensive end a year ago and would provide perhaps the best combination of end and tackle for Ohio State. Sophomore Tyler Friday is similar to Tyreke Smith in size and stature, as both are around 6-foot-3 and 265 pounds. They are big enough to rush from inside, yet quick enough to be effective at it. Dre’Mont Jones was a three-year starter at defensive tackle for Ohio State, bursting on the scene in 2016 as a redshirt freshman in place of starter Tracy Sprinkle, who suffered a season-ending injury in the first game of the year. Jones’ 44 tackles in conference play in 2016 was fourth-highest on the team. It was one more tackle than Michigan linebacker Jabrill Peppers, who was the Big Ten’s Defensive Player of the Year. Jones went from 52 tackles in 2016 to just 20 in 2017 as offenses were quite a bit better prepared for him. He was still named a Third-Team All-Big Ten selection. He weighed his options following his redshirt sophomore season, but decided to return for a fourth year. As a fourth-year junior, Jones earned First-Team All-B1G accolades. He finished with 43 tackles, 13.0 tackles for loss, and 8.5 sacks. Jones also scored two touchdowns. And now the Buckeyes will not only have to replace his impact on the defensive line, but they will apparently also have to replace his 0.9 points per game as well. Last season, Dre’Mont Jones was backed up by sophomore Haskell Garrett and freshman Taron Vincent at the three-technique defensive tackle position. Garrett and Vince are the top two candidates to replace Jones in the starting lineup. Garrett played in every game for the Buckeyes last season, recording seven tackles. Vincent played in 10 games, garnering three tackles. 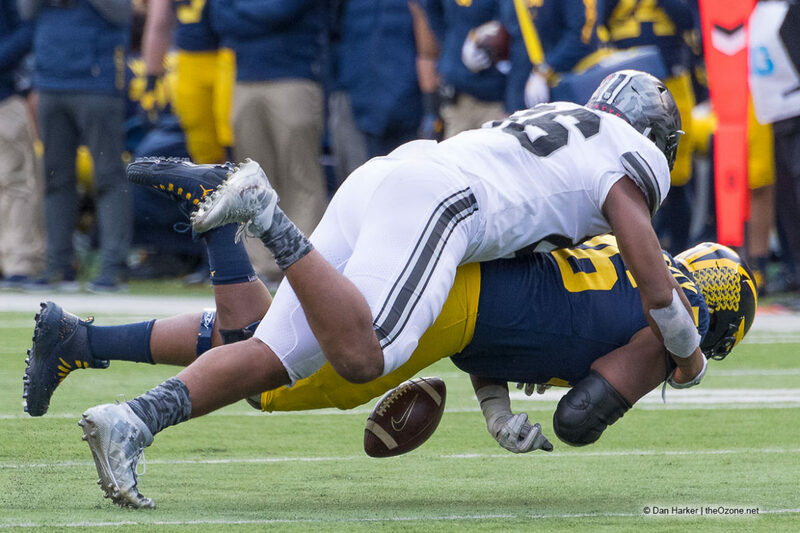 Defensive line coach Larry Johnson has said in the past that rising sophomore Tommy Togiai and fourth-year junior Antwuan Jackson could play either nose tackle or three technique. Togiai had a productive freshman season in 2018, playing in 12 games and notching 10 tackles with two tackles for loss. Jackson played in just four games last season, finishing with one tackle. Fifth-year senior Jashon Cornell could also be utilized here, just as he was back in 2017. He played in every game last season at defensive end, picking up 15 tackles, two tackles for loss, and a sack. True freshman Jaden McKenzie will be interesting to watch, but don’t expect him to make a play for the starting lineup just yet. lvbuckeye, brodybuck21, RB07OSU and 1 other person like this.